A grim sinkhole swallows children, a crazed killer stalks subways, and sharp swords spill blood in the new issue of Indie Comics Horror! Indie creators Terry Cronin, Joe Sergi and Paul Bradford invite us to darkness in the issue shuffling into April’s Previews, Diamond’s comic book pre-order catalog, under Aazurn Publishing. 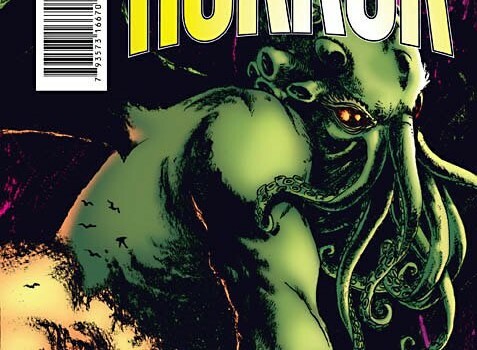 This issue, bigger than Indie Comics Magazine #1, presents nine complete tales of dread under a monstrous Lovecraftian cover from indie legend (Caliber, Moonstone, BOOM!, IDW) Andy Bennett. Terry Cronin is a creator of Students of the Unusual and the author of The Skinvestigator novels featuring dermatologist detective Harry Poe. Terry joined forces with Pat Martin, Jeff Hall and Bob Lizek to create 3 Boys Productions, responsible for the annual Melbourne Independent Filmmakers Festival. The Students of the Unusual comic series features horror tales based on the myths, legends and history of Terry’s home state of Florida. Joe Sergi’s first novel, Sky Girl and the Superheroic Legacy, was released from iEnovel in 2010. That same year, Joe received the Haller Award for Best Writer from the Comicbook Artist Guild at New York ComicCon. He was selected as a semi-finalist in the Who Wants to Create a Superheroine contest sponsored by the Shadowline Imprint of Image Comics. Originally from Scotland, Paul Bradford was brought up on the British comics that helped twist him into the writer he is today. Now living in Western Australia, he writes comics, writes Gothic poetry under the pseudonym Hierophantom, and has produced small press “zines” through his company Inertia Publications. 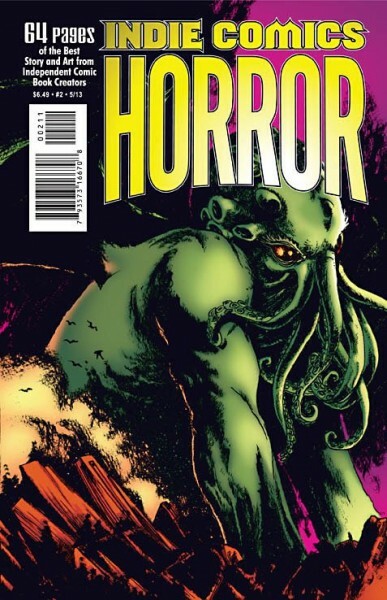 Information about other independent comic book creators and a video preview of Indie Comics Horror #2, with music by the appropriately indie Star Destroyer, are online at http://indiecomicsmagazine.com/. With no huge overprint, no digital version and no back issue sales, Indie Comics Horror #2 is available ONLY at your local and online comic book shops. It is best to pre-order from April’s Previews, said Beatty. Some Indie Comics Magazine issues, like 2011’s Christmas issue, are now hard to find.